Mechanical, electrically driven, stepped-gear calculator. The accumulator is at the top and can show a result to 20 places of decimals. The numbers entered can be to 10 places of decimals. 375 mm x 320 mm x 215 mm (15" x 13" x 9"), 16 Kg (35 lbs). Made in Switzerland by H.W. Egli S.A., Zurich. Dates from mid-1950s (serial number 75173). View underneath, with the bottom cover removed, showing the electric motor which powers this model. Hand-operated models were also available. The name 'MADAS' is derived from the initial letters of "Multiplication, Automatic Division, Addition, & Subtraction". It is a mechanical calculator, driven by an electric motor and automatically performs the four standard functions (with a lot of whirring and clunking !). The H.W. 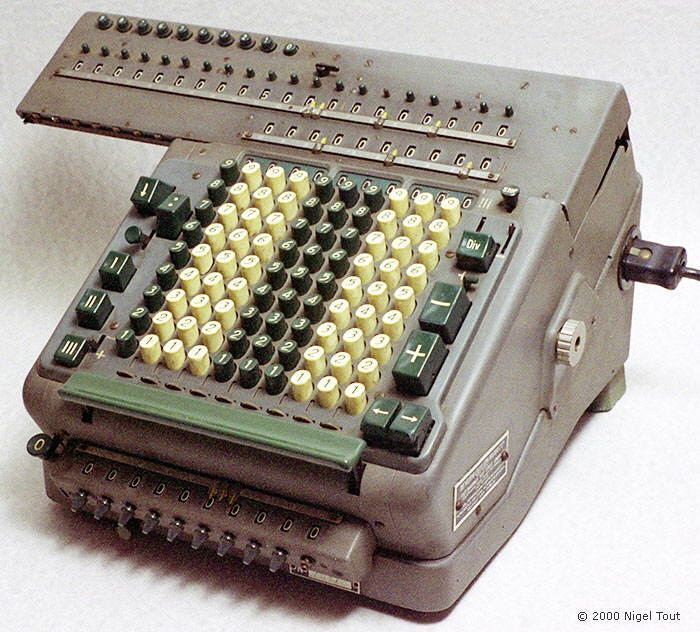 Egli company developed The Millionaire direct-multiplication calculator around 1900. Although successful and selling, with improvements, to 1935 these machines had the disadvantage that they were large, heavy, and expensive. To mitigate these problems the company developed the 'MADAS' machine around 1910, based on the stepped-gear mechanism, which could also perform automatic division. However, the early 'Long' MADAS machines were still rather large and heavy so the mechanism was dramatically redesigned from around 1930 to produce the series of 'Portable' MADAS machines, of which the model above is a later example. Gérald Saudan has a site with information about everything that you would want to know about MADAS mechanical calculators at http://www.madas.ch/, including details of all of the models and videos of parts of the mechanism operating. Especially interesting is a video of opening a machine, in order to repair or clean the various parts. Also, the history and internal workings of MADAS calculators are described in an article by Ray Mackay at http://www.xnumber.com/xnumber/madas.htm. 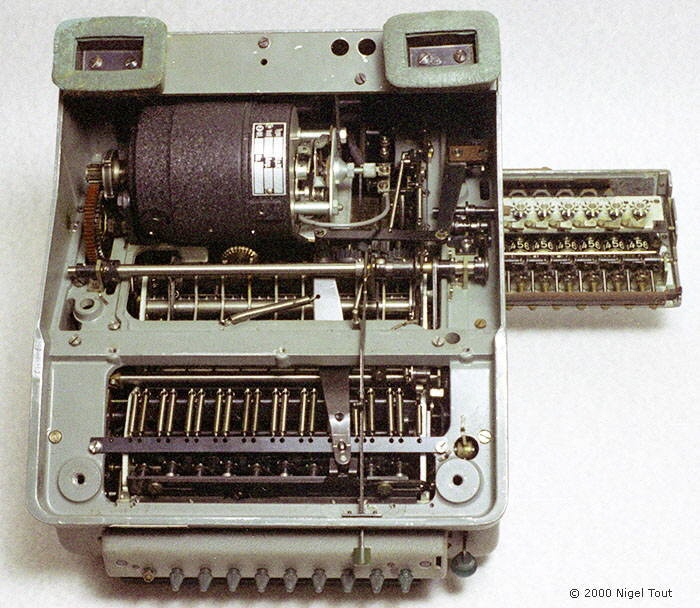 In John Wolf's Web Museum there is an overview of Millionaire and MADAS calculators, including pages showing a MADAS calculator disassembled into its various mechanisms. It vividly illustrates the vast number of high-precision components required and the ingenuity in squeezing everything into a small space.